Despite the 16 hour claim, and despite the fact that this is a “stain,” it does not last for more than several hours. Three to four at the most, and that’s with no eating! Rest assure, This is true for any lip product. Stains adhere color to the top layer of the skin on your lips. But because your skin naturally sloughs off its top layers over time, that color will gradually disappears. However, you can definitely extend the life of this product by applying chap-stick or a clear gloss over it. I think these lip stains are a pretty new thing…I never recalled them a few years back. 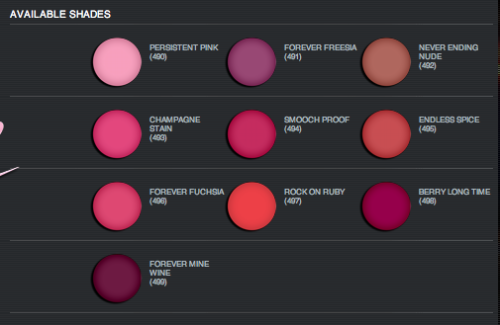 These come in ten different shades, but the Rock Out Ruby is my favorite. It is a blue-based red, which is very hard to find. Ladies always complain that they do not look good with red lipstick. Mainly because they are pink based and just look too clown-like, and brite. If this is you..Then you will like this blue-based color. Despite the name having Ruby in it. It is the perfect shade of sheer red. Perfect for this time of year. These look like a magic marker, with a felt tip point, as shown above. As with a magic marker, you need to make sure to keep the cap on tight, otherwise they will probably dry out. You also need to keep in mind, that you have about 30 seconds to apply. It dries VERY fast, and if you take your time, you will have streaks. I start off by using it as a lip pencil, then fill in the middle. It dries fast with a matte finish. Very subtle, and natural looking. It does not come off on your coffee or tea cup. Nor your water bottle. I recently had a friend tell me about Cover Girls lip stain, but will wait for another CVS coupon. I have tried three of the QUEEN Helene facial scrubs, but this is my favorite. The first few ingredients are: water,walnut shell powder, and oatmeal. Unlike their Apricot Scrub, that has a much harsher exfoiliation, The walnut shell powder is a lot more finer, and will not rip your delicate skin. Combined with the oatmeal, it draws out impurities and unclogs your pores…Which I am finding.. as I age, my pores are a lot more noticeable on my face.Ugh! I had the most perfect skin when I was a teenager. My friends all had terrible acne, and use to get mad at me, because my skin was always so clear. I had great clear skin right up until my 30th birthday. Then BANG! I don’t know what happened, but it was like puberty just started. I have two teens, and while my oldest has been broken out for the past few years..Her sister has flawless skin. She is obviously taking after me, and prances around the house without so much as a blemish. I like the idea that they put honey in it… Which is said to replenish lost moisture, due to the cleansing. The smell is also very pleasant. Some people think it smells like bread. All I smell is the honey. Which I love. The back of the tube says to use it a few times a week. But I use it once a day. In the shower. I see immediate results, and my skin feels so soft afterwords. I then immediately follow with my vitamin C-power moisture cream. For only $4 at Walmart. I would say it is worth it. It comes in a toothpaste-like tube. After watching a news program that mentioned the differences between these two words, it led me to have a discussion with my two oldest daughters. Jealousy is wishing you had something that someone else has.. It makes you angry and you start to wish they did not have what they have. You become bitter, and jealousy stirs your heart in the wrong way…hoping something bad will happen to the person. That they will somehow lose what they have. ENVY on the other hand, is feeling like you also would like what someone else has. You wish you both had it. And I’ll admit, I have been guilty of this in the past. I think we all have. At one point or the other. Whether we would admit it, or not. When I pass a big Victorian house and see a women out watering her beautiful flower bed, I silently think to myself how nice it would be if I too, had that lifestyle. The same goes when I see a lady dressed very nice, and has what I perceive as a perfect figure. The news said that Face-book, has attributed to making many people jealous of what others have. And yes, I know what the bible says about Jealousy. I know it can destroy a person of any age. Children today seeing all their friends with iPhones and iPads..I get it. It is some thing that even I struggle with. I know people that are on Government assistance, yet their children, and themselves, have all the latest electronics. I see it. My kids see it..And for a brief moment..Envy strikes a cord. I’m not immune to it. None of us are. We do the best we can with what we have, and hope to set a good example to our children along the way. I think it is important that our children see our strengths, as well as our weaknesses..